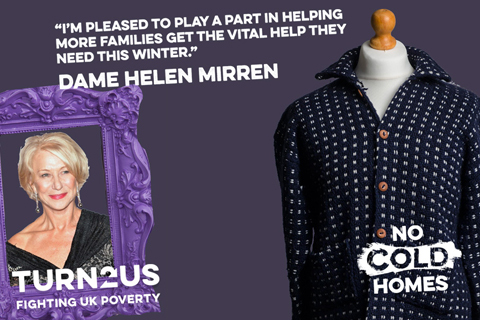 The Turn2us No Cold Homes campaign celebrity clothes auction is going live this Cyber Monday (30 November). The auction will be hosted on eBay and opens at midday. A host of famous faces have donated items of winter clothing for the charity’s biggest ever celebrity clothes auction to help fight fuel poverty in the UK. Bidders can take their pick from a range of items from stars including Ed Sheeran, Dame Helen Mirren, Hugh Laurie, and Jeremy Irons. As a national charity helping people in financial hardship to access welfare benefits, charitable grants and other support, Turn2us hears regularly from people suffering in cold homes because they can’t afford their energy costs. New research by Turn2us found that one in two low income households across the UK are struggling to afford their energy costs, despite being in work. Amongst the hardest hit are people with disabilities, with over two in three (67%) reporting their struggles, and families, with almost two-thirds of working parents (65%) unable to meet these costs*.